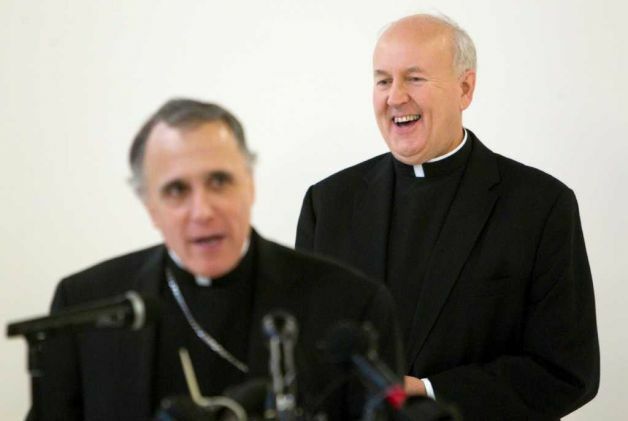 As plans came together for today's press conference (above) marking Rome's launch of the US' Anglican Ordinariate, the question came up as to whether Cardinal Daniel DiNardo (foreground), both as the ranking prelate slated to be present and Latin-church bishop of the Chair of St Peter's Houston home-base, would "preside" at the event. "No," a source replied. "Jeff Steenson will preside -- the focus is on him now." On behalf of so many pilgrims of Catholic unity who have looked forward to this day, I wish to thank His Holiness, Pope Benedict XVI, for this priceless gift, the Personal Ordinariate of the Chair of St. Peter under the patronage of Our Lady of Walsingham. I pray that we who will come into full communion through this Ordinariate will bring the Holy Father much joy through our love and faithful service to the Catholic Church. To His Eminence Donald Cardinal Wuerl and His Excellencies Kevin Vann of Fort Worth and Robert McManus of Worcester: thank you for laying this good foundation for the Ordinariate. To His Eminence Daniel Cardinal DiNardo -- thank you for your generous hospitality in providing for our principal church and a place in the University of St. Thomas and St. Mary’s Seminary for the formation of our future clergy. And, personally, to His Excellency, Archbishop Michael Sheehan of Santa Fe, who brought me into the Church and ordained me: my wife and I love you dearly. You all represent so many people who have worked so hard to bring the Holy Father’s vision to reality! I ask for your prayers for me and for those who will become members of the Ordinariate. There is so much to learn, and it is a steep learning curve. Be patient with us as we embark on this journey. Pray that we may strive to learn the faith, laws, and culture of the Catholic Church with humility and good cheer. But pray too that we do not forget who we are and where we have come from, for we have been formed in the beautiful and noble Anglican tradition. The Holy Father has asked us to bring this patrimony with us: “to maintain the liturgical, spiritual and pastoral traditions of the Anglican Communion within the Catholic Church, as a precious gift nourishing the members of the Ordinariate and as a treasure to be shared” [Anglicanorum coetibus 3]. Here is one thing I earnestly desire to share with you from the outset: Anglican spirituality has always emphasized the need to be gentlemanly in all of our relationships. May you see in us always the virtue of courtesy! The parishes and communities of the Ordinariate have been called, not to live in relative isolation, but to be fully engaged in the life of the local diocese; not to be assimilated, but to be integrated into the rich life of the Catholic Church. This Ordinariate of the Chair of St. Peter must be, above all else, an effective instrument for evangelization. But Jesus taught us that the unity of Christian people is the essential condition for evangelization (John 17:21). So this must be our hallmark: to build bridges, to be an instrument of peace and reconciliation, to be a sign of what Christian unity might look like. And gaudete in Domino semper (Philippians 4:4) to be joyful and happy Catholics! The establishment of the Personal Ordinariate is an historic moment in the history of the Church. For perhaps the first time since the Reformation in the 16th century, a corporate structure has been given to assist those who in conscience seek to return to the fold of St. Peter and his successors. But I would like to go back a little further, to the end of the 6th century, to see that this is not such a new thing. Pope Gregory the Great writes to St. Augustine, the first Archbishop of Canterbury, recently arrived from Rome, to urge him always to be a gracious and patient pastor in the way he gathers his flock. Anglicans love to read these letters, preserved in the Venerable Bede’s Ecclesiastical History of the English Nation, for they are a great witness to how the Church gathers her people from many different cultures and lands. The decree which this day establishes the Ordinariate begins with these words: “The supreme law of the Church is the salvation of souls. As such, throughout its history, the Church has always found the pastoral and juridical means to care for the good of the people.” In what Pope Benedict has given us today, I hear the voice of Pope Gregory the Great: “For things are not to be loved for the sake of places, but places for the sake of good things” (1.27). What a beautiful testimony to all that Catholic Christianity is! As previously noted both in the story's first word, a liturgical "installation" for Steenson and launch of the Ordinariate is planned for Sunday, 19 February, at 3pm, in Houston's recently-opened Co-Cathedral of the Sacred Heart. According to early word, the rite being planned is to center around an Anglican Use Mass. With rumors abounding in the Italian press of a possible consistory for the creation of new cardinals that weekend, however, the timing could end up proving tricky. As ever, we'll see what happens.